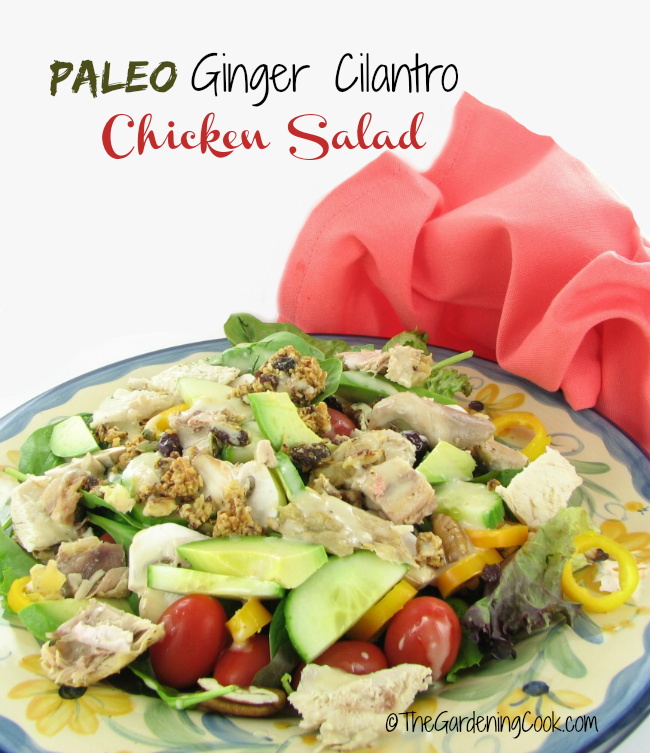 This Paleo Chicken Salad is simple to make but the ginger cilantro dressing takes it to a whole new level. It is rich and creamy, full of flavor and a perfect choice to pair up with chicken. It makes the perfect gluten free lunch time meal. 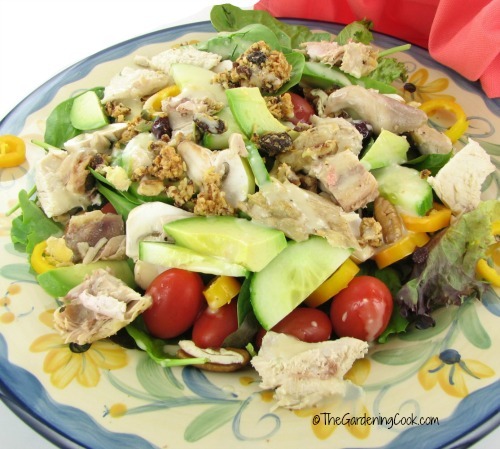 Ginger Cilantro Dressing Makes this Paleo Chicken Salad a Lunchtime Treat. All of their products are great and I like using them in unusual ways. I wanted to keep the whole salad one that is suitable for Paleo diets but also wanted some crunch that you can only get from croutons. This is where their Maple bacon granola comes in. It is a delicious mixture of nuts and seeds and has some really big chunks in it that are a perfect substitute for croutons. And the flavor the granola adds to this salad is something else. The salad is chock full of healthy veggies and tender pieces of boneless, skinless chicken breasts. The avocados go beautifully with the mild ginger cilantro dressing. The pecans also add a crunch to the salad and some heart healthy oils. The plate is a feast for both your stomach and your eyes! 6 ounces of cooked boneless, skinless chicken breasts, cut into cubes. Place your mixed green evenly on two large plates. Add all the fresh vegetables and top with the chopped chicken and avocados. Sprinkle evenly with the granola and drizzle with the ginger cilantro dressing. ← Fresh Herbs – Annual, Perennial or Biennial – Which is Yours?